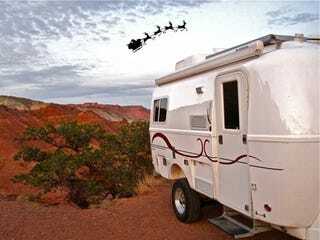 If Amazon is Santa, 400 folks living in RVs outside the Coffeyville, Kansas fulfillment center this winter are the elves. A few years back Chris Dunphy and Cherie Ve Ard flipped the bird to their desk jobs, packed their belongings in a custom 17-foot solar-powered fiberglass camper, and hit the road to live "at the intersection of Epic and Awesome." A couple months ago, while staying with friends, they noticed that Amazon was luring RVers to Coffeyville, Kansas, the site of the retail giant's original and largest fulfillment center. "We were located in San Diego at the time," explained Cherie. "We're part of a community of younger full-time RVers on Nurvers.com, a group of non-retired-age folks who are living the mobile lifestyle and kind of going outside the norms of 'Wait for retirement to travel.'" They noticed other RVers were flocking to Kansas to work for Amazon. The pay wasn't great—just above $10-an-hour, typically—but Chris and Cherie were planning on being in St. Louis for the holidays. Why not kill a month in Kansas working for Amazon? Fast forward a couple of weeks, and the self-styled "technomads" were putting down stakes at a state park about 20 miles from the four enormous but dull warehouses that comprise the Coffeyville hub. Their first day inside, Chris was awed. "Walking inside reminded me of the scene from Indiana Jones when they abandon the Ark in that giant warehouse. It's three stories high. It feels like an industrial library. Shelves going up and up and up." Hundreds of employees scurried, some "orange-badges" or "green-badges" hired by two temporary employment services mixed with the sought-after blue-badges of full-time Amazon employees, guided to their next destination by computers that flashed lights when bins were full or guided workers through the maze with handheld computers. "Pickers are basically playing a human Pac-Man game. They've got a computer scanner that they carry around that tells them where to go. They find their little shelf. One slot might be a book. The next shelf over might be a toaster. Or an iPod. The next slot after that might be a pair of jeans." Amazon didn't always lure in "workcampers" from the RV community. "From what the agency people had told us, Amazon had a bad experience busing in people from Tulsa," says Chris. "There was a lot of theft and a lot of people who weren't really serious about the job." Workers from Tulsa were adding a 4-hour round-trip commute to an already grueling 10-to-12 hour shift, Cherie is quick to add. "They'd get there exhausted." Enter the workcampers, people making a go at living in their RVs full time—many of whom might be otherwise overqualified. "I think Amazon was skeptical at first," says Cherie. "But after the first trial year they were very, very impressed. Workcampers came in enthusiastic about working, since most are professionals. We've owned businesses or been managers." White collar workers, trying their hand at the gypsy life. Even better, the workcampers were able to stay locally. Not all of the camps provided for the workcampers were exactly inviting. Chris and Cherie pulled into the one just before Thanksgiving, but could tell it wouldn't make for a pleasant stay. "The closest one was a city park called Walter Johnson. RVs were very close together. Half the campsites had full hookups, which meant they had water, electricity, and sewer dump on-site. Half the sites just had electricity and water and they had what they call a 'Honey Wagon' that comes around and pumps your sewage out a few times a week." Some RVers had been in Coffeyville since August. Worse, it was cramped and muddy. "Coffeyville also had a flood three years ago, so it was very, very wet and muddy because the area had been washed out, then rained on recently." They eventually moved on to a state park, which was lovely, but also four times farther away. They rarely had time to enjoy the scenery. "We were on the night shift," says Chris, "Our day would start when we would wake up at three in the afternoon. Work started at five." "Every shift starts with what they call a 'Stand Up.' You gather in one area with your usual department—ours was called 'Sortable Singles,' which sounds like it should be the name of a dating site—and they'd count off how many people they needed in each department. Run through a few announcements. Give you a few safety tips. And then they lead you through five minutes of group stretches." Cherie was mainly a packer, putting items in the box and scanning them. Chris, on the other hand, was a "water spider." He explains, "A water spider is responsible for keeping all the packers supplied, so ideally they'd never need to stand up and leave their station to get any other supplies like all the different sizes of boxes, plus making sure their tape machines and paper-spitter machines are operating." "I never quite exactly figured out why they call it a water spider. My guess is back in the history of assembly line jobs, the water spider would be the person who would bring people on the line water to drink. Nobody seemed to know!" Work was monotonous and—for a couple who had been living a relative life of leisure—full of endless hours of standing on one's feet. "24-Hour Fitness, Amazon-style," laughs Chris. Cherie liked to think of it as having "a personal trainer for 60 hours a week." Inside the warehouses, machines and man alike were controlled by Amazon's computerized assembly line. In one part of the factory, Chris watched two giant elliptical carousels, each one the size of a football field, carry wooden trays around at 15mph. "All the items are coming in the totes on one side of this giant machine. There are people who take each individual item, scan them and put them on the trays as they go by. The trays get to a chute where their order is being assembled, tilt, and the product flies down into that space. When all the items for a particular order are assembled in one place an orange light comes on and somebody comes by." Above, another carousel brought an endless procession of empty boxes to be filled with the orders. It wasn't exactly what Cherie had envisioned. "When we told people were going to do this, someone said 'Whenever I click the order button on Amazon, I always imagine a chorus of happy, singing Oompa-Loompas riding around on Segways and shipping my stuff.' Well...no. It's not exactly like that." "The computer has to prioritize how it's going to send out all the pickers in this giant facility. So someone could order a book and a sweater and an iPod, and those could be in completely different corners of the whole facility. But somehow they all arrive within about 30 minutes of each other." It's efficiency even Willy Wonka could love. Chris and Cherie wouldn't work another season at Coffeyville, but not because they were miserable. "Everybody treated each other really nicely!" says Chris. It's just that the two are "experience junkies, craving the new," even if working for Amazon certainly gave them a fresh perspective on American culture. "You'd have a tote come down the line, and you'd have adult toys right next to kid toys in the same bin," laughs Cherie. "The Obama Chia Pet was an oddity. And the Bill Clinton corkscrew. And I did have a tote one afternoon that was full of mooning gnomes." Chris geeked on it pretty hard. (Before he became an migrant worker, Chris was a founding editor for boot magazine—later known as Maximum PC. He also worked for Palm.) "Just getting to experience that type of work, to literally see consumer culture flow beneath your fingertips, was absolutely fascinating. You feel the pulse of the market." Besides their paychecks, all they're left with are memories—cameras weren't allowed inside. "One of the rules at Amazon is that you're not allowed to bring anything into the facility that they sell." Chris went through a bit of withdrawal. "One of the hardest things about the job was going without my iPhone for a month. It was a great way to break the addiction of wanting to Twitter about things. You'd be like, 'Oh my God, I just saw this Bill Clinton corkscrew and you won't believe where the corkscrew comes out.' But oh crap, I can't tweet."